It’s done and on its way to Alberta. I couldn’t be more pleased with this outfit – simple, chic and I’m so happy with the way it came together. The ice-blue sheath is Vogue 2396. Here it is without the lace shirt. I pre-washed the linen when it was purchased about 12 months ago (longer, maybe?). I had originally intended to simply underline it with silk organza, but it was a little on the show-all-possible-undergarment-lines semi-opaque, so I also lined with bemberg. I added a small kick pleat at the CB, since my DF isn’t a fan of hemline slits. This is such a lovely simple design that it will be wearable for many occasions. I faced the armholes and neckline with a self-drafted facing instead of taking the lining to the edges as per Vogue’s instructions. I think this finishes up the edges in a much nicer way, and the support afforded by the self-fabric keeps everything in shape properly during wear. Isn’t that icy blue such a pretty summery colour? 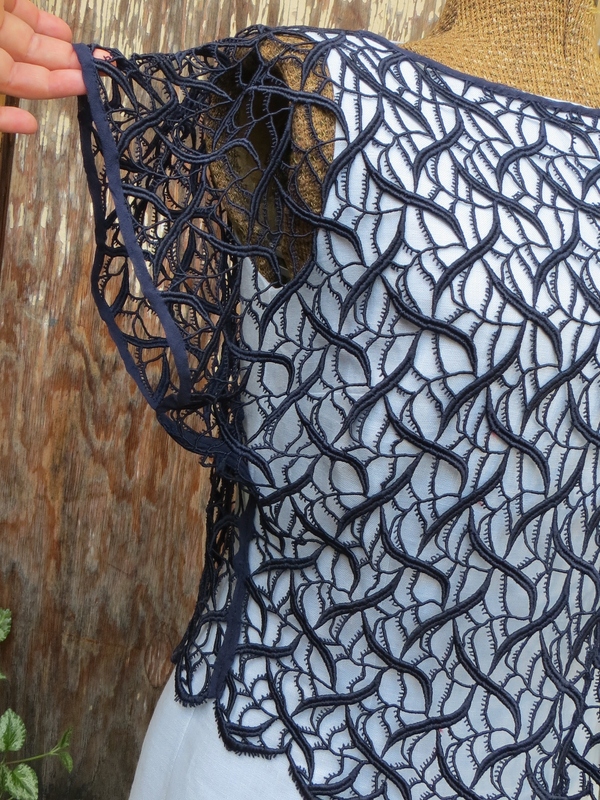 And now the nitty gritty of the lace top. 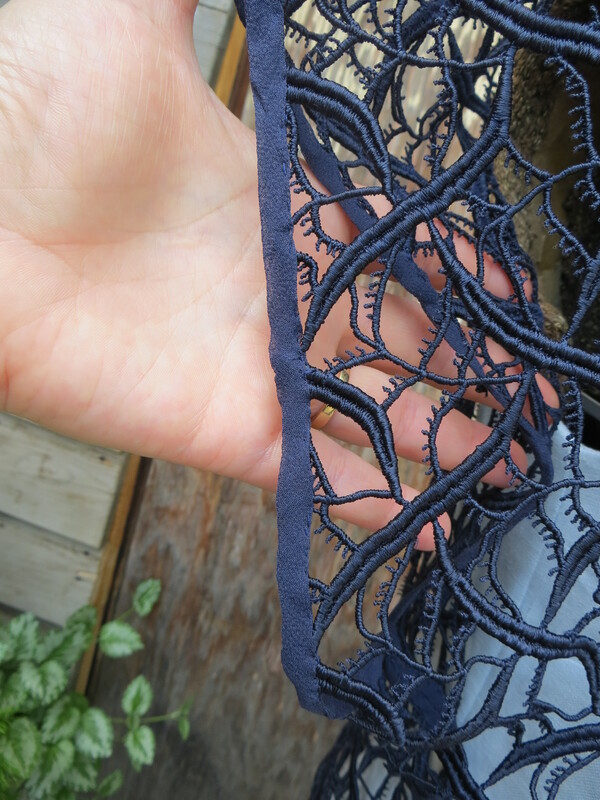 I folded the lace in half, matching the scalloped selvedges, laid the front of the dress pattern over top to get an idea of the neckline shape, took a massively deep breath, and slashed from the centre front out to the shoulders. I’m sorry I don’t have pics of this process, but it was pretty simple, and I’m hoping I’ll write well enough for you to follow along. Then I put the lace “top” on over the dress as it was on Ms. Vintage, adjusted the shoulders so that the hem hung horizontally, pinned it to the shoulders of the dress, and carefully trimmed away the excess to match the dress’s neckline. Then I tried using my silk ribbon to bind the neck edge. I’ve not pictures of that either, and for good reason. It was an atrocious ugly mess. Of course, I can hear some of you more experienced sewistas muttering, because silk ribbon is not bias, and therefore will not shape smoothly. Yup. Stitch and learn. Tia Dia this is just a treat. It really is. Chic, elegant and very very beautiful. 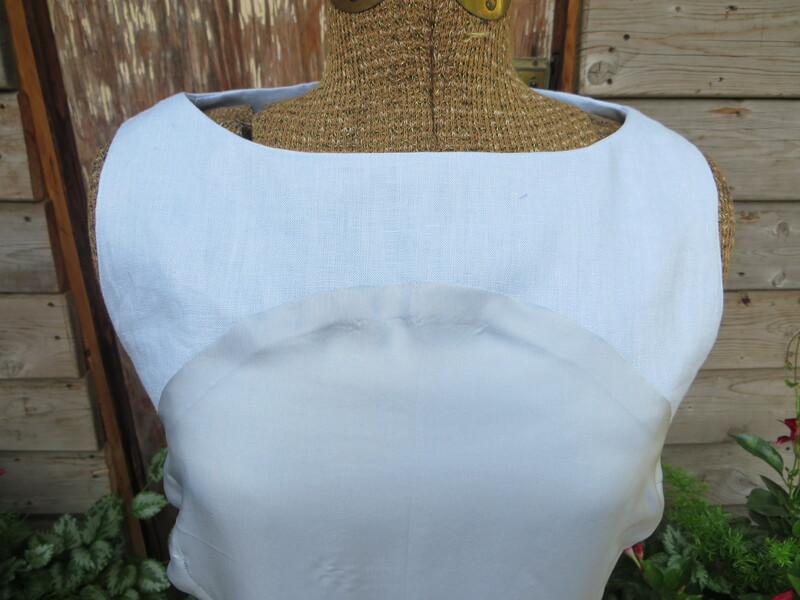 Plus I may have to copy your idea of a white linen sheath dress. 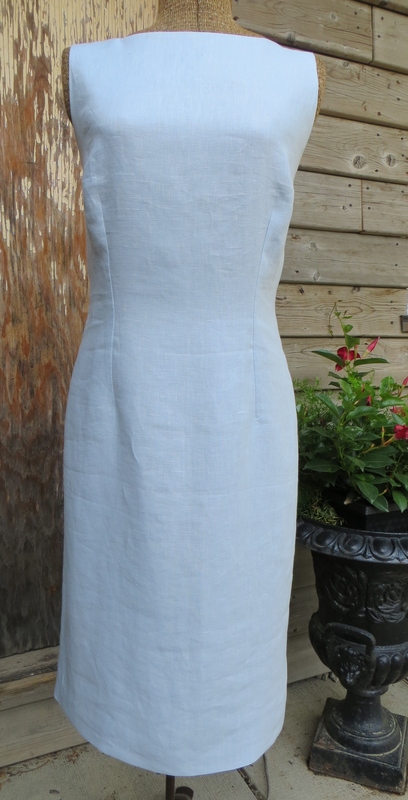 I have white linen I don’t really know what to do with … until now. lovely dress, a real head turner! I just love it! 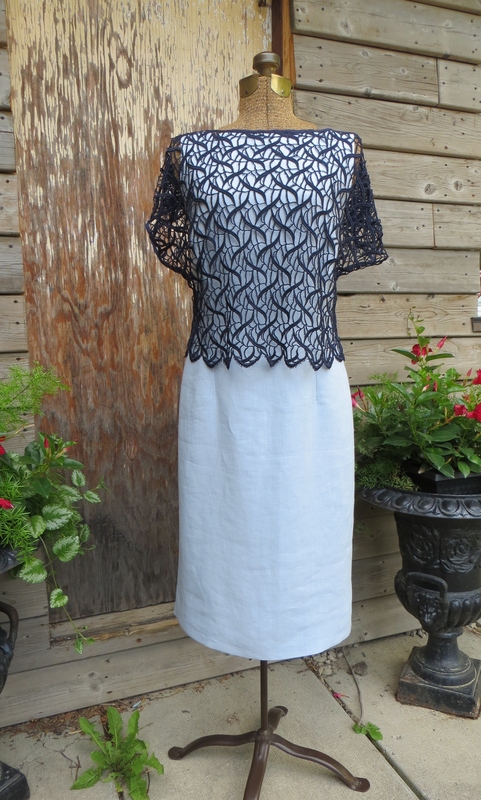 The beautiful lace really pops against the simple white dress. Oh my gosh, SO stunning! Your lucky friend must be absolutely thrilled with this elegant outfit. I am her very lucky friend and all i can say is that it is a truly amazing piece of art and I looked amazing because of it. gorgeous – all my girl parts are beeping for that V2396 sheath. Lovely dress for your friend! The lace top makes it special. You used the lace!!!!!!!! It’s so pretty, I want to fondle it. Lol. Bet you can’t wait to wear it. ‘This is awesome! 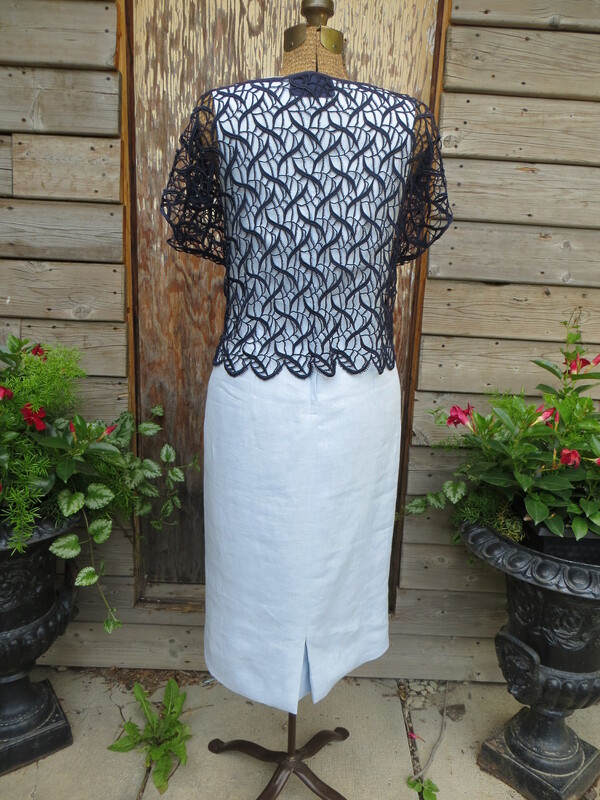 The lace top is gorgeous and I think it is such a clever idea that both pieces can be worn separately. Both will get a lot of wear, I am sure. A great project! AMAZING! I love this combination. Simple dress and the fabulous top! Perfect finish!